Comic-Con was insane, as usual. The drive from Los Angeles to San Diego took almost 7 hours (yes, seven) instead of 3, and as a result, at one point, I whizzed in a bottle (yes, a bottle). For the record, it was an empty Vitamin Water lemonade bottle, which was nice because it gave me, you know, a sense of symmetry. The rest of the convention proceeded with no unorthodox waste removal procedures. I'm catatonic right now, so you'll have to wait until my next post for non-whizz-related highlights from the convention. 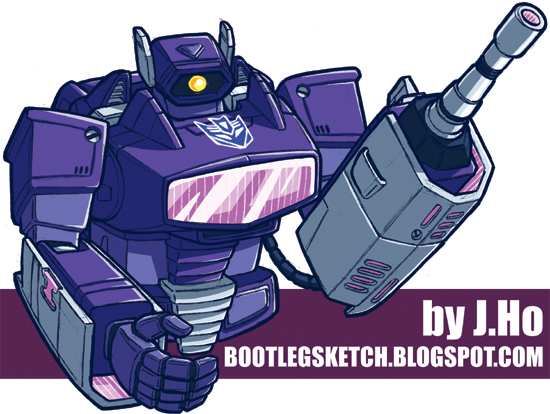 This is Shockwave, drawn with a modified transformation that I came up with. The original toy had a gun barrel which was essential for the gun mode, but served no purpose and had no venue of storage in robot mode--my revised transformation imagines that the gun barrel could split apart and slide back on Shockwave's arms. That's all. Sleepy-time now. There was a rumor floating around that it took you 10 hours to get to Comic-Con. Oh, and I just spit my Vitamin Water all over my computer!!! no, i think 10 hours would literally have killed me. as for YOUR vitamin water... at least all you did was spit it.